Urban structure is the arrangement of land use, explained using different models. In the grid model of cities, land is divided by streets that run at right angles to each other, forming a grid. This model promotes development. The concentric ring model describes the city as an ecosystem in which residents sort themselves into a series of rings based on class and occupation. This model’s general applicability has been challenged. Urban structure can also describe the location of the central business district, industrial parks, or urban open spaces. The sectoral model says the city develops in wedge-shaped sectors instead of rings: certain areas of a city are more attractive for various activities, which flourish and expand outward in a wedge. The multiple nuclei model assumes that car ownership granted people more mobility and led the the development of specialized regional centers within cities. The irregular pattern model was developed to better explain urban structure in the Third World. It attempts to model the lack of planning or construction found in many rapidly built Third World cities. central business district: The central area of a city in which a concentration of certain retail and business activities takes place, especially in older cities with rail transportation. urban open space: In land use planning, urban open space is open space areas for parks, green spaces, and other open areas. Human Ecology: Human ecology described the city as analogous to an ecosystem, with natural processes of adaptation and assimilation. In grid models, land is divided by streets intersect at right angles, forming a grid. Grid plans are more common in North American cities than in Europe, where older cities tend to be build on streets that radiate out from a central square or structure of cultural significance. Grid plans facilitate development because developers can subdivide and auction off large parcels of land. The geometry yields regular lots that maximize use and minimize boundary disputes. However, grids can be dangerous because long, straight roads allow faster automobile traffic. In the 1960s, urban planners moved away from grids and began planning suburban developments with dead ends and cul-de-sacs. The concentric ring model was postulated in 1924 by sociologist Ernest Burgess, based on his observations of Chicago. It draws on human ecology theories, which compared the city to an ecosystem, with processes of adaptation and assimilation. Urban residents naturally sort themselves into appropriate rings, or ecological niches, depending on class and cultural assimilation. The innermost ring represents the central business district (CBD), called Zone A.. It is surrounded by a zone of transition (B), which contains industry and poorer-quality housing. The third ring (C) contains housing for the working-class—the zone of independent workers’ homes. The fourth ring (D) has newer and larger houses occupied by the middle-class. The outermost ring (E), or commuter’s zone, is residential suburbs. Concentric Zone Model: The Concentric Ring Model described the city as a series of concentric rings, each home to a different group and social function. This model’s general applicability has been challenged. It describes an American geography in which the inner city is poor while suburbs are wealthy—elsewhere, the converse is the norm. In new, western U.S. cities such as Los Angeles, advances in transportation and communication have blurred these “zones. ” Further, the model fails to account for topographical and physical features of the landscape. Even in Chicago, the concentric rings were semi-circles, interrupted by Lake Michigan. In 1939, the economist Homer Hoyt adapted the concentric ring model by proposing that cities develop in wedge-shaped sectors instead of rings. Certain areas of a city are more attractive for various activities, whether by chance or geographic/environmental reasons. As these activities flourish and expand outward, they form wedges, becoming city sectors. Like the concentric ring model, Hoyt’s sectoral model has been criticized for ignoring physical features and new transportation patterns that restrict or direct growth. Hoyt’s Sectoral Model of Urban Growth: In Hoyt’s model, cities grow in wedge-shaped sectors radiating from the center. The multiple nuclei model was developed in 1945 to explain city formation after the spread of the automobile. People have greater movement due to increased car ownership, allowing for the specialization of regional centers. A city contains more than one center around which activities revolve. Some activities are attracted to particular nodes while others try to avoid them. For example, a university node may attract well-educated residents, pizzerias, and bookstores, whereas an airport may attract hotels and warehouses. Incompatible activities will avoid clustering in the same area. The irregular pattern model was developed to explain urban structure in the Third World. It attempts to model the lack of planning found in many rapidly built Third World cities. This model includes blocks with no fixed order; urban structure is not related to an urban center or CBD. Urban structure can also refer to urban spatial structure; the arrangement of public and private space in cities and the degree of connectivity and accessibility. In this context, urban structure is concerned with the arrangement of the CBD, industrial and residential areas, and open space. 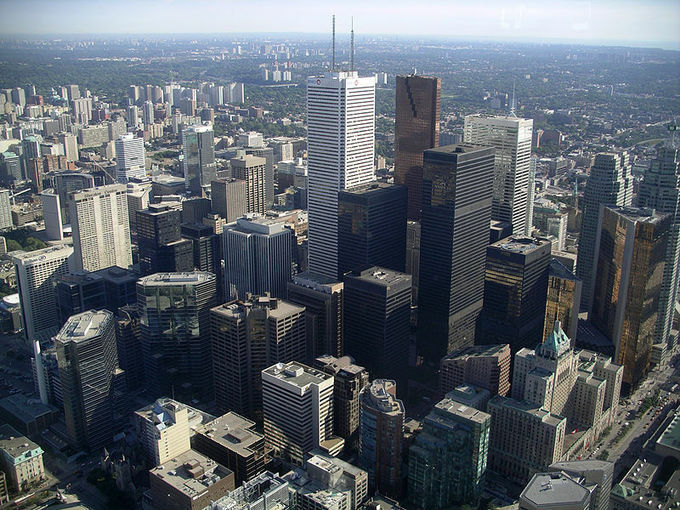 A city’s central business district (CBD), or downtown, is the commercial and often geographic heart of a city. In North America, this is referred to as “downtown” or “city center. ” The downtown area is often home to the financial district, but usually also contains entertainment and retail. CBDs usually have very small resident populations, but populations are increasing as younger professional and business workers move into city center apartments. An industrial park is an area zoned and planned for the purpose of industrial development. They are intended to attract business by concentrating dedicated infrastructure to reduce the per-business expenses. They also set aside industrial uses from urban areas to reduce the environmental and social impact of industrial uses and to provide a distinct zone of environmental controls specific to industrial needs. Urban open spaces provide citizens with recreational, ecological, aesthetic value. They can range from highly maintained environments to natural landscapes. Commonly open to public access, they may be privately owned. Urban open spaces offer a reprieve from the urban environment and can add ecological value, making citizens more aware of their natural surroundings and providing nature to promote biodiversity. Open spaces offer aesthetic value for citizens who enjoy nature, cultural value by providing space for concerts or art shows, and functional value—for example, by helping to control runoff and prevent flooding.